Representatives from First Alert, the Chicago Bulls and the Chicago Fire Department hosted a “Take Charge of Safety” event to educate K-5 students at Webster Elementary School, 4055 W. Arthington, about home fire and carbon monoxide (CO) safety on Thursday, Feb. 8th. The day included presentations by uniformed Chicago firefighters, break-out sessions with CO/fire safety activities, entertainment from Benny the Bull and donations of carbon monoxide alarms and other materials for children to take home to their families. As the most trusted brand in home safety, First Alert conducts extensive outreach to fire services nationwide and supports numerous organizations to assist in raising awareness of fire and CO safety. 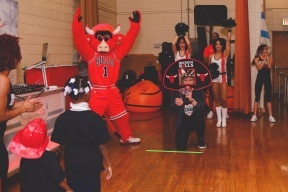 The Chicago Bulls have a strong history of giving back to the community by contributing time, materials, resources and financial donations to organizations that share the team’s commitment to youth education, youth health and wellness, violence prevention and military and first responder support. 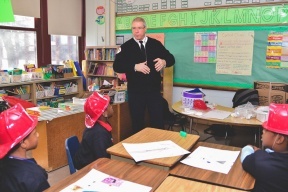 The Chicago Fire Department is the third largest municipal fire department in the U.S., as measured by sworn personnel. It is also one of the oldest major organized fire departments in the nation.